It is over seven months since a private memorial service was held for Mike Alsbury, the pilot who lost his life in the disintegration of Virgin Galactic’s SpaceShipTwo (SS2) at an altitude of 15.5km. The other pilot, Peter Siebold, left hospital a few days after the crash nursing a shoulder injury; their differing fates apparently determined by Siebold’s ability to unbuckle himself prior to the automatic deployment of his parachute. Alsbury on the other hand was found still attached to his seat.1 Alsbury and Siebold’s mission was a test flight of what Virgin hopes will become regularly scheduled tourist trips into space. The cause of SS2’s crash has been subject to much speculation in the media, coverage that has included voices calling for Virgin to quit the space business because of alleged incompetence.2 Aside from the most likely effect of such calls being to entrench the determination of Virgin and its boss Richard Branson to prove them wrong, they have also been made without reference to arguably an even bigger issue that should be discussed. Nowhere in any of the coverage has mention been made of the impact that the industry would have on the atmosphere and global climate were this type of spacecraft ever to make frequent space tourism a reality. The crash took place shortly after the launch of the Intergovernmental Panel on Climate Change (IPCC) ‘synthesis report’ which summarises the latest research on the science and policy of climate change,3 and the month after the disclosure that Richard Branson had starkly failed to meet his 2006 pledge to spend $3bn on technologies to combat climate change,4 so the media should have shown more awareness of the context. It is other types of space tourism however that (at least until the recent crash) have had a greater immediate prospect of expanding rapidly, largely because they do not depend upon low earth orbit infrastructure, such as the ISS, in order to operate. Often included in this category are so called zero-gravity flights that simulate weightlessness in aircraft flown on a series of parabolic trajectories. However, these don’t involve entering what is conventionally defined as ‘outer space’ – beyond the Kármán line, 100km above the Earth’s surface. Suborbital flights do however enter outer space and it is this sector of the industry that has been set for imminent expansion. There are a number of companies presently developing craft capable of suborbital flight and promising to take tourists on flights in the coming years. One of these, XCOR, based in California’s Mojave desert, is developing the Lynx suborbital spacecraft with just two seats; one for the pilot, one for a passenger. They claim that occupancy of this seat will come with a price tag of $95,000. Between flights it will simply have to be refuelled before embarking upon another horizontal take-off and landing. With such a short turnaround time the company envision a single craft being able to make four suborbital flights per day.8 Enabling this relative simplicity in turnaround is the fact that, like most other rocket engines, including the Soyuz, the Lynx craft will burn a mixture of liquid oxygen and kerosene. In contrast to this ‘typical’ engine is that of the spacecraft belonging to the most widely publicised space tourism venture coming emblazoned with the Virgin brand and with Richard Branson as its figurehead. Virgin Galactic’s SpaceShipTwo is equipped with a single hybrid rocket motor. In the world of rocket engines however, ‘hybrid’ does not mean that its hydrocarbon fuelled propulsion system is supplemented by an electric motor, as in a hybrid car. Rather hybrid here describes the use of fuel in different states of matter. Until May of last year that meant for SS2’s engine the fuel was solid synthetic Hydroxyl-terminated polybutadiene and liquid Nitrous Oxide (basically, rubber and laughing gas). This engine, named of course ‘RocketMotorTwo’, had a number of problems during tests and was deemed unable to provide sufficient power to take the craft to the desired height. The subcontractor responsible suggested reducing the number of passengers on SS2 to four, but Virgin apparently determined that it could not make money under such circumstances.9 They decided instead to use a different hybrid engine developed by the principal contractor, Scaled Composites, which burns a thermoplastic rather than rubber. Scaled Composites are the company responsible for the original SpaceShipOne (SS1) and won the 2004 Ansari X prize for the first NGO to put a manned craft into space twice in one week. Unlike the Lynx craft, SS2, like SS1 before it, is air launched, meaning it is dependent upon a mothership, in this case a cargo vessel powered by four jet engines called WhiteKnightTwo (WK2). SS2 launches from WK2 at 15.5km before firing its engine for approximately 70 seconds and attaining speeds of close to 4,000 km/h. The plan is that it will then coast up to 110km where it will spend 5 minutes in the weightlessness of space before beginning to descend. SpaceShipTwo thus launches from its mothership close to the tropopause (the top of the troposhere) before flying through the stratosphere and mesosphere and will just cross the Kármán line into outer space. Its engine will therefore burn within the stratosphere and it is here that its emission of BC will provide the most atmospheric altering effects of the entire endeavour. The results of the 2010 modelling study that Toohey co-authored showed a non-uniform effect over the globe of sustained regular launches of these spacecraft.5 Assuming a launch site at a latitude of about 33°N (in line with where Virgin Galactic’s Spaceport America has been built), the majority of the BC was constrained between 25°N and 45°N and only about 20% of the BC travelled into the southern hemisphere. This asymmetry could be the driver of the resultant modelled decrease of ozone at the tropics and sub-tropics but an increase at the poles. This altered distribution of ozone has been attributed to greater stratospheric overturning circulation in previous studies, which has been shown to be produced by relatively small differential heating effects in the stratosphere. Within the northern hemisphere stratospheric zone, where most of the BC was distributed, temperature increased by approximately 0.2°C whereas, because very little BC went into the southern hemisphere, there was no heating there. This suggests that the latitude of the launch site may play important role in the effect on ozone distribution, which was found to reduce ozone in the tropics by the same amount as CFCs have caused. 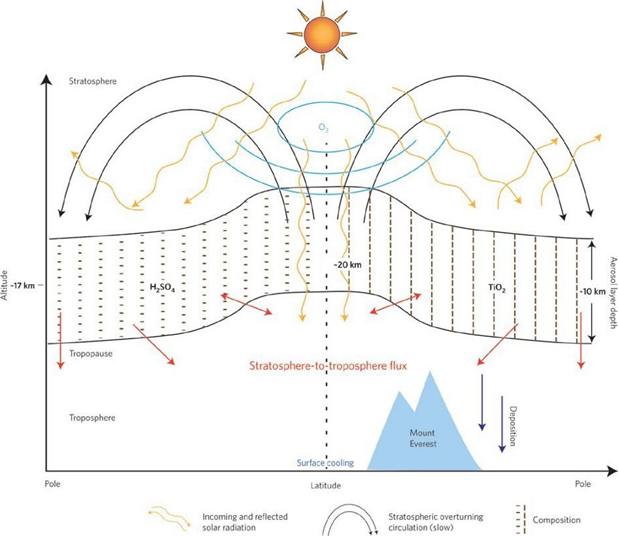 The increase in the stratospheric circulation caused by the BC load is found to be roughly equivalent to the changes induced in this circulation due to modelled greenhouse gas emissions. Modelled temperature changes at the surface also differed regionally and seasonally, with up to a 1°C increase at the poles,13 but taken together show BC from 1,000 launches per year will influence global climate by about the same amount as the current global aviation industry, with a radiative forcing effect of 43 mW/m2. Also of note is that the climate change effect of the emitted BC exceeds the climate change effect of the emitted carbon dioxide by a factor of about 100,000. When Virgin Galactic boast about the CO2 emissions from SpaceShipTwo in comparison to other air travel,14 they are ignoring the most significant climate impact their new fleet of machines is likely to have. The study by Ross, Mills and Toohey (2010) was the first to model the global climate impacts of the particle emissions by rockets and as a single study with many parameters only loosely constrained it is far from the final word on the subject. However, despite the money being poured into these high profile ventures and the scale of the impact they could have on the atmosphere, the calls of the authors for their work to be built upon and extended remain largely unanswered. Current knowledge of the atmosphere, coupled with the University of Colorado’s recent modelling work, should be considered sufficient to suggest a course of extreme caution for space tourism, especially considering the huge greenhouse gas forcing that humans are already responsible for. It is only with the benefit of hindsight that the other global environmental impacts of many applications of the technological innovations of the industrial age are now known. But we can no longer claim to be ignorant of the risks of a free-for-all in the stratosphere. The current plans for space tourism look much more like a demonstration of reckless disregard for the future. Philip Chapman studied marine biology and oceanography at Southampton University, and has recently been investigating coastal adaptation to rising sea levels in the global south in collaboration with Yale University. He also has a long-standing interest is space technology issues. 4. Klein N (2014). This Changes Everything: Capitalism vs. The Climate.Simon and Schuster. 5. Ross M, Mills M, Toohey D (2010). Potential climate impact of black carbon emitted by rockets. Geophysical Research Letters, vol.37. 7. Seedhouse E (2014). Tourists in Space: A Practical Guide. Springer. 10. Pope F et al. (2012). Stratospheric aerosol particles and solar-radiation management. Nature Climate Change, vol.2,pp.713–719. 11. Hinds W (2012). Aerosol Technology: Properties, Behavior, and Measurement of Airborne Particles. John Wiley & Sons.